Welcome to paradise! 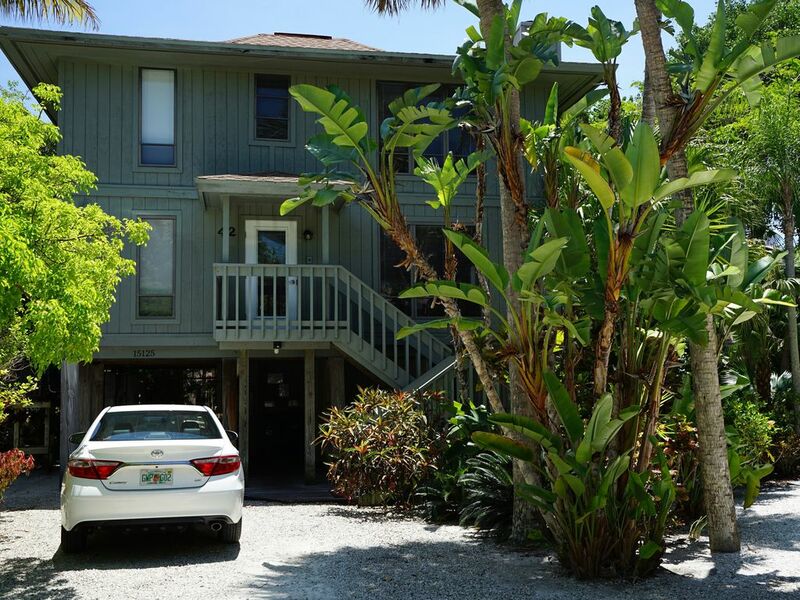 Our vacation rental home is located in the private, quiet community of 'Sunset Captiva' on beautiful Captiva Island, Florida. The community is centrally located on more than four miles of spectacular beach on the Gulf Of Mexico and has it's own pool, tennis courts, and recreation area complete with gas grills and picnic tables. From our home, it's only a few minutes walk to the finest in dining, shopping, and recreation. If you need a car...you're going too far! Upstairs, the home has two bedrooms: the master bedroom has a king-size bed, private bath, and dressing area; the second bedroom has two twin extra-long beds, private bath, and dressing area. Both bedrooms exit onto a spacious 300 square foot sundeck complete with chaise lounges and tables. Downstairs, the home has a powder room, living/dining room, kitchen, laundry, and large screened porch. The home is completely furnished. Sorry, no smoking or pets are permitted. 42' Plasma Home Theatre in Living Room. 38' LED in Master Bedroom. We have stayed at several different homes in Sunset Captiva over the years. The community itself is ideal for a winter vacation. No car is really needed as everything is within walking distance. I walk a few minutes to the east to see the sunrise and then a few minutes to the west to enjoy the day on the Gulf as well as the sunset. As for the different homes we have rented, Mark’s is by far the nicest. Not only is the decor very tasteful but the home contains everything you could possibly need and more. Mark is extremely responsive and goes above and beyond the norm to be accommodating. It truly is an exceptional find. What a lovely home in Sunset Captiva! You are close to everything on the island-- restaurants, shops, beach, pool, sunsets and sunrises (or so I've heard from those who get up that early😄�). As much or as little as you want to do is all right there for a perfect vacation. The house is well maintained and has everything you need. Nicely appointed kitchen is especially welcome as is the ice maker. Mark was responsive to all questions very quickly and made renting stress free. I have no hesitations recommending Mark's beautiful home on fabulous Captiva. This is a wonderful house in the lovely community of Sunset Captiva, and we thoroughly loved our stay there. It was spotless, and has been so well-maintained with many updates. The owners are great, and anxious to answer any questions and tend to any needs. They have thought of so many details that make the house very comfortable. We had everything we needed. I highly recommend this house as a great Captiva rental.